Hi, it’s Beth today! Are you looking for creative ways to up your cardmaking? See how I played around with the Creative Photo Corners to come up with something different. I needed to make a few masculine cards for Father’s Day and graduation. 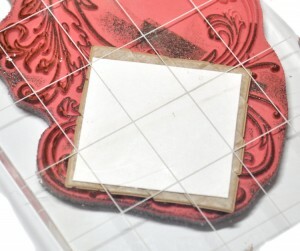 Using Creative Photo Corners, I made a frame & embellishment design, I think it’s pretty cool! The embossed “V” on the Creative Photo Corners created an interesting texture when I started stacking and layering them. I created a frame, or a stack of frames made by lining up the Creative Photo Corners. First, start stacking and lining up the edges. See how they build into a square! For the larger black square, I didn’t like the way they lined up on their own so I cut a square and aligned the edges of the Black Creative Photo Corners to the edge of the square paper. That was much easier then eyeballing it! 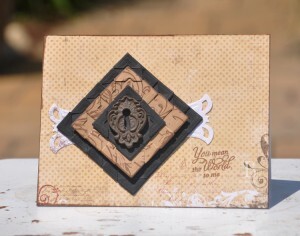 I stamped a flourish image to the Kraft square, and then inked the outside edges of it. I felt like it needed some kind of design element to it. 3D Foam Squares were added to the back of the Kraft square, and used MyStik™ Permanent adhesive with the other squares. For the vintage keyhole I used Crafty Power Tape, perfect for heavier or bulkier items. Next, I stacked the Creative Photo Corner elements onto each other, then added a die cut behind them, and adhered it onto a patterned paper card front. I stamped a sentiment to finish it off. Don’t you love the texture the Photo Corners add to this card! This entry was posted in 3D Foam Squares, Adhesives, Beginner, Cards, Crafts & Tutorials, Crafty Power Tape, Creative Photo Corners, MyStik® Dispensers, Skill Level, Tutorial and tagged 3D Foam Squares Regular Black, Beth Pingry, Bo Bunny, Card, Card Making, Clearsnap, Crafty Power Tape 20' Dispenser, Crafty Power Tape 20' Refill, Crafty Power Tape 81' Dispenser, Creative Photo Corners Mix Pack, Embellishments, Father's Day, JustRite Papercraft, Masculine, Melissa Frances, MyStik Permanent Strips, MyStik Permanent Strips Value Pack 1 Dispenser 2 Refills, MyStik Permanent Strips Value Pack 3 Refills, Spellbinders Paper Arts, Stampers Anonymous, Stamping, Techniques, Tutorial. Bookmark the permalink. One Response to "Cardmaking with Creative Photo Corners"
VERY clever use of the photo corners!! Love the texture and so easy to assemble. GREAT job!!! !